Duke has found his forever home in Bishopston with Charlotte. What a lucky boy he is going to be. Thank you for giving this lovely boy a home. Thanks also to Simon who very kindly fostered Duke whilst he was waiting for that special person. 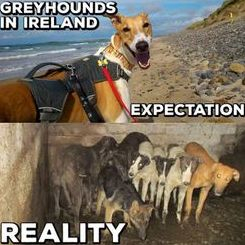 This year's Dawgust Appeal launched today and we would like to thank the people who have already donated to the Dawgust Justgiving page to help Eila Moloney save more dogs from the Limerick Pound and trainers in Ireland. Although August is a little way off it is greyt people are already thinking about ways to raise money. 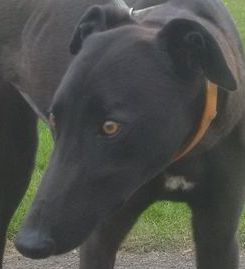 Bronagh, one of our lovely little black girls, has found her forever home in Clevedon with Rebecca and Paul. Thank you both for giving this dear little girl a second chance in life. Massive thanks must also go to Sharon Hunt​ who very kindly fostered Bronagh for a few weeks. 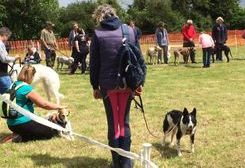 After last week's washout at Stoke Gifford, it was a great relief when the day of the Mangotsfield Festival Dog Show dawned dry, but cool enough to be comfortable for all our canine competitors. 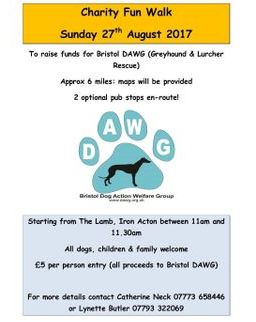 It turned out to be a very successful day, with lots of happy participants and Bristol DAWG was happy too with the amount of funds raised! We should like to take this opportunity to thank everybody that volunteered or took part, especially our wonderful judges, Megan and Kate. Thank you also to Mangotsfield Festival Committee for inviting us. Megan and Kim Simpkins-Jenkins will once again be running the annual DAWGUST auction. 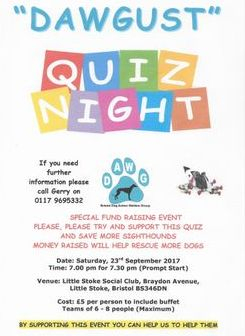 It has raised nearly £5000 over the last two years so it's always a fabulous, well supported part of DAWGUST! Barbara, Dave and co had a little fundraiser in Frome yesterday and raised just over £100. A photo is attached of their honorary guests – DAWG girlie Beanie (was Jeanie) came along with her best friend Barney and the picture is of them on the left with Karma and Spirit. It was really good to see Beanie settled so happily with her new family. 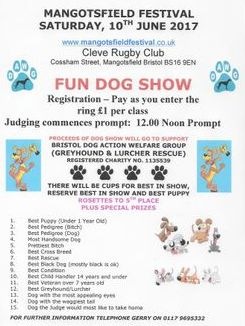 We would like to say a massive "thank you" to Penny and Georgina for hosting the Fairlight Fields Charity Dog Show today which raised an amazing £577.38 for Bristol DAWG. Brilliant day which we thoroughly enjoyed, especially as the trustees got the chance to enter some of the classes themselves. This year for Dawgust we are upping our game. 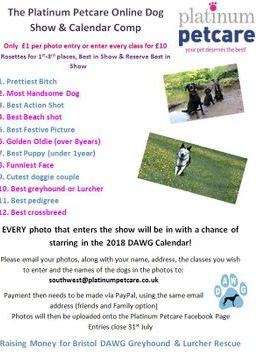 Platinum Pet Care plan to climb Snowdon, Wales' tallest mountain, for sponsorship to help these fabulous hounds. If anyone would like to join us then that would be fab! Current date is set for 29th July. 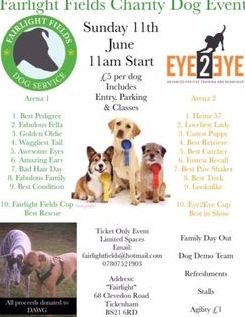 There will be a £35 registration fee per person. This is to cover a guide for the group for safety reasons. We are hoping to take Luna once she is passed fit by the vet and we would encourage anyone who plans on bringing a hound to do the same thing. 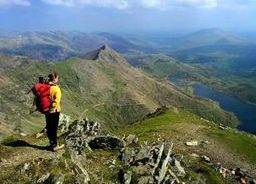 So if you fancy joining the Team DAWG Snowdon Expediti9n please get in touch. 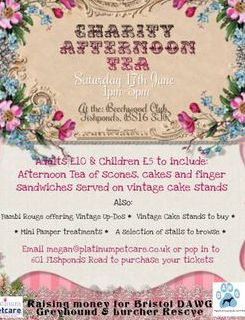 The afternoon tea organised by Platinum Petcare was a lovely mellow afternoon, enjoyed by all who attended. Our thanks go to everybody who supported the event, especially those who helped. Massive thanks also to everyone who very kindly made cakes, the response was amazing and we could not believe the generosity of DAWG supporters. The event raised £602. 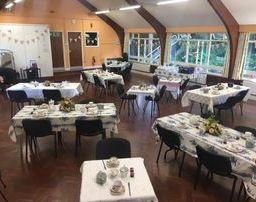 At the end of the afternoon we still had quite a few cakes left, so Julie and Adrian Sims said they would take what was left and have a small gathering at their house the next day, inviting family, friends and neighbours for an afternoon tea and cake. This raised £216 - amazing, thank you so much Julie and Adrian. 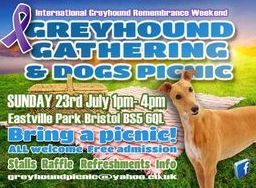 Total raised for this weekend £818 - you really are a greyt bunch of people.